To contain the collection to be housed in the lower ground floor area of the new building, it was critical that 50,000 linear metres of shelf space was made available. 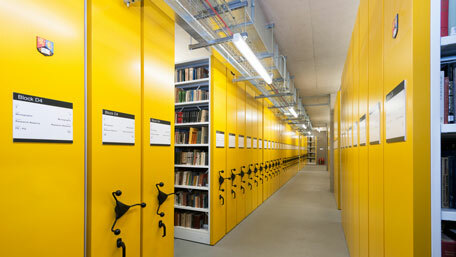 To achieve this meterage, and working in conjunction with the Architects, Associated Architects of Birmingham and personnel from the University, Ecospace produced a final layout using mobile shelving that would accommodate not only octavo, folio and quarto sized books, but a comprehensive audio collection and 46 plan chests, some on mobile bases. Layouts were also produced for both static and mobile shelving in the open access areas of the library on the ground and three upper floors. 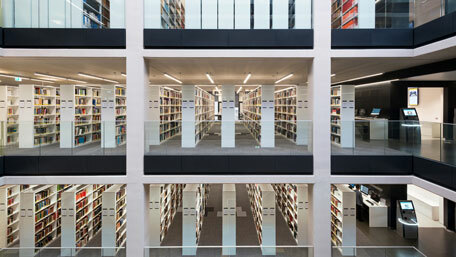 A feature of the shelving in the open access areas of the library, where nearly 13 linear kilometres of shelf space has been installed, is the use of glass end panels for both static and mobile units. These mobile units, which are situated on the third floor where there is a raised computer floor with a 650mm void under, necessitated the installation of a steel support structure for the tracks to ensure that the weight of the systems was not only carried by the structural concrete deck but maintained the independence of the computer floor itself. The installation was completed on budget and on time over an 18 month period in accordance with a programme agreed with the main building contractor, Carillion.